Rear-End Car Wrecks and Sacroiliac Joint Injuries | Gainsberg Law P.C. The causes of rear-end collisions can vary based on the circumstances. Sometimes the rear driver failed to engage the brakes in time. In other cases, the rear driver was driving distracted or speeding. As well, these collisions can occur as a result of driver intoxication or when defective brakes are involved. Regardless of the reason, victims of these crashes can sustain serious injuries, particularly back injuries that are extremely debilitating. Sacroiliac joint dysfunction is one type of spinal injury that can result from rear-end car collisions. This injury is often misdiagnosed and is accompanied by severe pain in the lower back and buttocks area. The sacroiliac joint connects the lowest part of the spine – lower sacrum – to the pelvis. It carries the weight of the upper body down to the pelvis and legs. Many lower back complaints can be attributed to problems with this joint, despite the fact that the condition may not be diagnosed. A common symptom of sacroiliac joint dysfunction is pain in the buttocks which makes it uncomfortable for the individual to sit. Pain may also extend to the lower back, groin area, thigh, and foot, also including irritation of the sciatic nerve. Activities such as climbing stairs, walking, and sleeping may bring significant discomfort, with the mental stress of the pain taking a toll as well. Common signs of injury to the sacroiliac joint include the constant need to shift weight from side to side when standing, or from one side of the buttocks to the other while sitting. Conventional tools of diagnosis such as MRIs, x-rays, and CT scans are not able to diagnose dysfunction of the sacroiliac joint, although they may rule out other reasons for the pain. Diagnosis is often carried out with an arthrogram and block. The joint is injected with a contrasting dye. The joint is then injected with a local anesthetic and a corticosteroid. The movement of the dye is tracked with the fluoroscope for CT scan. As the patient, you will then be directed to sit, stand, and move into particular positions that tend to initiate the pain. If the medication provided stops the pain, a problem with the sacroiliac joint is likely the culprit. The steroid and anesthetic combination should eliminate the pain for a number of days up to several weeks. If the medical testing procedure mentioned above results in a diagnosis of sacroiliac joint dysfunction, the first step in treating your condition may be the least invasive option, which includes nonsteroidal anti-inflammatory drugs, spinal manipulation, corticosteroid injections, pulsed radiofrequency ablation, physical therapy, or the use of a brace to support the joint. These methods may be used independently or in combination together to treat your condition. If these minimally invasive techniques do not achieve success, fusion surgery may be the next course of action. This surgery involves the installation of screws and bone grafts to stabilize the sacroiliac joint. This may include the use of an electromagnetic stimulator that enhances the probability of a proper connection. A more recent even less invasive surgery that does not use of bone grafts involves making a tiny incision and installing three titanium implants into the joint with the cannula. This procedure minimizes bleeding, results in a shorter hospital stay and allows the patient to bear weight sooner. 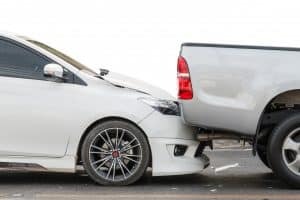 Although assigning liability for a rear-end car crash is seldom a complicated issue, insurance companies may assume that these collisions do not lead to significant injuries and as a result avoid offering adequate compensation for victims. If you have been diagnosed with sacroiliac joint damage, it is essential to have an experienced Chicago auto accident attorney working on your behalf to effectively present your case and maximize your recovery. Regardless of the reason for your rear-end collision, if the negligence of another party was involved, the Chicago legal team at Gainsberg Law is here to provide you with the legal support you need. We can investigate your case and help you recover the compensation you deserve for your losses. Give us a call today at 312.313.1621 or use our contact form to request a free, initial consultation about your case.